I am in denial. Summer is NOT almost over. I swear it just started here in the Pacific Northwest! Hopefully September will be beautiful and we'll get an extra month of sunshine. One can only hope. Maybe if we make more summer clothes we'll trick the sun into staying around. 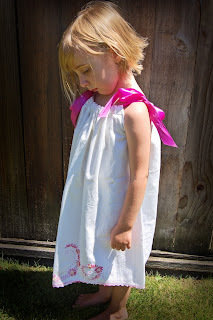 . .
We couldn't resist posting this adorable summer frock made from--get this--a vintage pillowcase! Another chance to "restyle" something. We found these at the antiques flea market, two for $5. They have beautiful crocheted edges that must have taken painstaking hours to create. Gorgeous! And if it seems too late for this breezy beauty, think how cute it would be on a big girl with a long-sleeved shirt over a pair of jeans! We threw together a quick tutorial so you can make one of these before sweater-weather arrives. . .
1. Fold a clean and ironed pillowcase in half lengthwise. 3. Sew bias tape to the armhole sections of the dress using a zig-zap stitch. 4. Turn pillowcase inside out and fold down the top two times on each side and iron. The amount you fold down will depend on the size of the ribbon you choose to use. Sew near the outer edge of the fold, leaving enough room for your ribbon to slide through. 5. Attach a safety pin to the end of your ribbon and thread a piece through each side. Turn pillowcase right-side out. Tie the ribbons together in a bow. Voila! This also makes a great tank top for an adult. 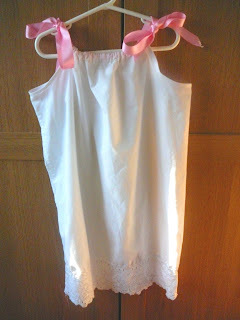 Or for those more daring, you can turn it into a cute little nightie. You just have to make the straps a little longer. A great way to feel feminine and restyle something that you already have. Love it! love it! Love it! Now I need to go through my mom's old pillow cases! I don't have too much time to do crafts while working full-time, but my little 2 1/2 year old would look great in the pillowcase dress! It looks so easy, I may have to try it out over a weekend. 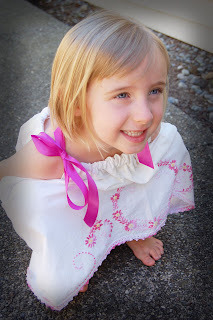 Our summers in DC last a little longer than yours, so she could be wearing such a dress until well into October! Thanks for stopping by my blog via Tip Junkie! The cookies are really tasty and easy! I am so excited about this post! I have some vintage pillowcases that have embroidery on the ends and I think they will make beautiful pillowcase dresses for the midget next year!! Thanks!! You are definitely going in my reader! I love how sweet those dresses are, I can't wait to hit up the antique alley here in my neck of the woods this week. Those are super sweet and my littles will look so cute in them. GREAT Tutorial, I'm not a sewer and you've inspired me! Thanks Ladies! Sooooo Cute! One of my girls will only wear skirts or dresses. This would be perfect for her!